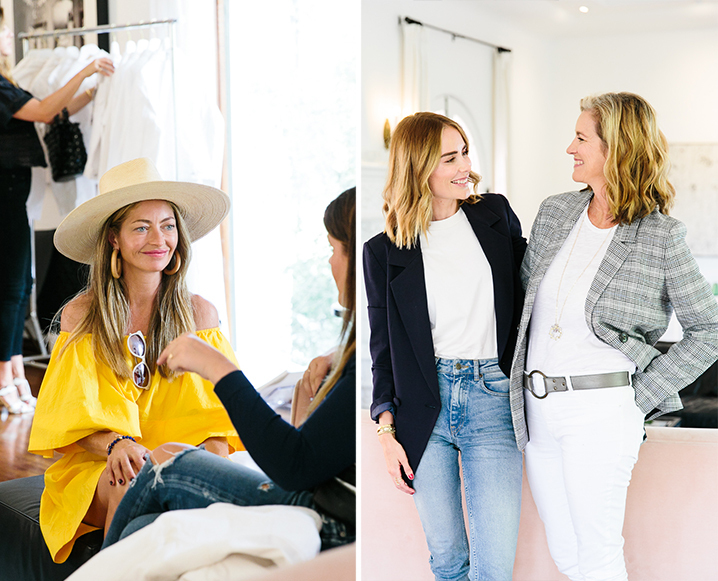 We recently joined some of our favorite LA ladies for an afternoon at the beautiful Los Angeles home of Danish model and fashion designer, Anine Bing. Anine and True Botanicals‘ co-founder Hillary Peterson partnered for this fun affair fueled by natural wines, plant-based bites and botanical facials with Julie Civiello Polier, otherwise known as the magical hands behind this life-changing reiki facial. We gathered to celebrate the launch of Anine’s new white denim jacket which will be wardrobe appropriate for months through LA’s long Indian summer – and even after that it qualifies as a California winter white. Pieces from Anine Bing radiate LA cool – and True Botanicals has, in a few short years, become the go-to natural skincare line for more girls in our community than we can count! Fittingly, the crowd in her stunning LA living room included Whitney Port, TV hostess Cat Deely, hat queen Janessa Leone, Hedley & Bennett’s Ellen Bennett, and Darling Magazine’s Sarah Dubbeldam. Guests enjoyed food from TCM fave, Haute Chefs LA and wines curated by Helen Johannesen while they waited to have their white denim jackets custom embroidered. One lucky reader will win a collection of True Botanical skincare + a white denim jacket by Anine Bing. Share your email in the box below for a chance to win! This giveaway closes September 6th. One winner will be notified by email. Open to residents of the continental US only. By entering your email you’re agreeing to receive really awesome content from TCM, True Botanicals and Anine Bing via email! Share the post "Inside LA Designer Anine Bing’s Home + A True Botanicals Giveaway"
I’ve been wanting to try True Botanicals! White all year long! Even in Seattle! Thanks for your post. I love True Botanicals! What could be better but Anine Bing and True Botanicals! !